I think by now everyone knows that I love color, especially when applied to a painterly, artistic print. 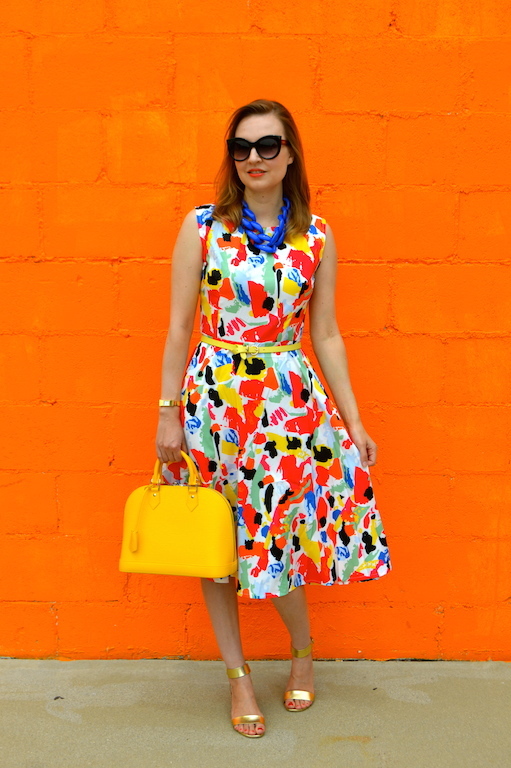 For these reasons, I was drawn to this adorably playful and colorful print featured on my latest dress from SheIn. 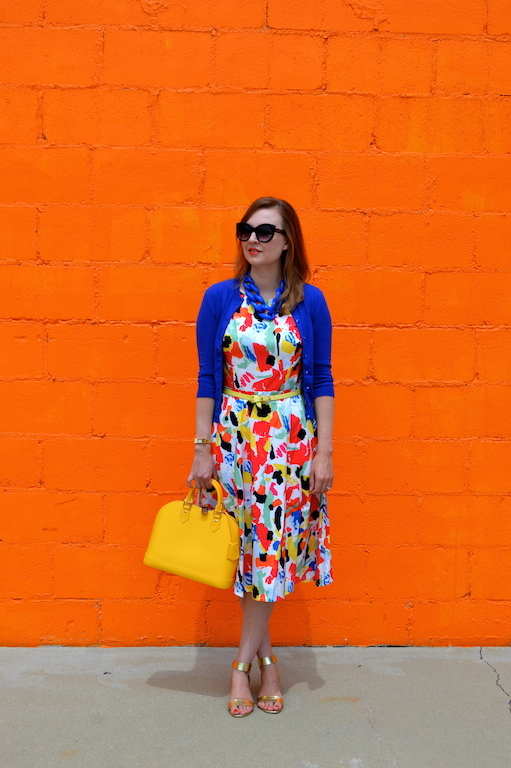 With so many colors found in my multi color flare dress, it was a little hard to decide on which accessories to pair the dress with, but I decided to "go bold, or go home" and double down on equally bright accessories in the form of a cobalt blue cardigan, necklace and yellow bag. The same philosophy of opting for bright colors holds true for the background I selected, which is quite obviously a gigantic orange wall. While editing these pictures, I couldn't help but to notice that the orange color of the wall is distinctly "Cheetos Orange". This thought triggered a rather Pavlovian reaction of salivation just at thought of the delicious cheesy snack! I love the bold bright colors together! Perfect outfit for spring or summer! I love how you describe the wall because Cheetos are my favorite snack! Any way your dress is pretty and colorful and I love how you added your cardigan. Your accessories also looks good with the dress. Wow what a gorgeous dress! It really looks perfect for spring and summer. That dress is so cute and perfect for spring. Love the details you added and that amazing orange wall! So fun. Thanks for coming to Thursday Moda Linkup. I love everything about this outfit!!! And I love hot cheetos, I try not buy them since I can eat the whole bag in a sitting. Wow! The colors and print of the dress are so eye-catching and amazing. Also love the bright accessories! 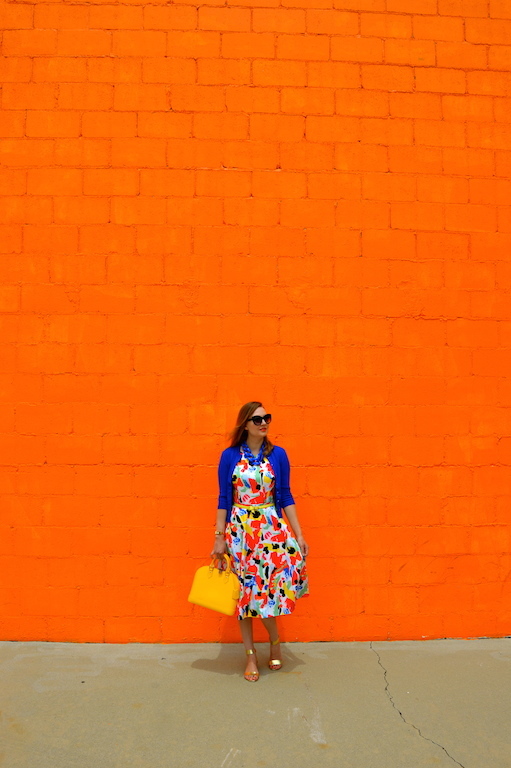 You do know how to wear color and you wear it so well! You're a girl after my own heart. I'm a huge colour fan and so adore this entire look on you. The dress is totally fab and I love how you've styled it up. And that orange backdrop is inspired! Lovely to find your blog. You are my COLOR GODDESS!!!! Gorgeous, as always, Katie. 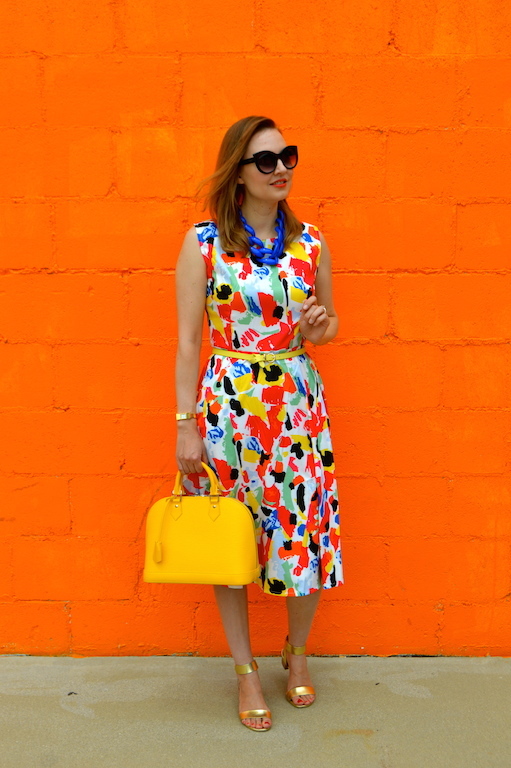 Thanks so much for linking up with Fun Fashion Friday & enjoy your weekend! 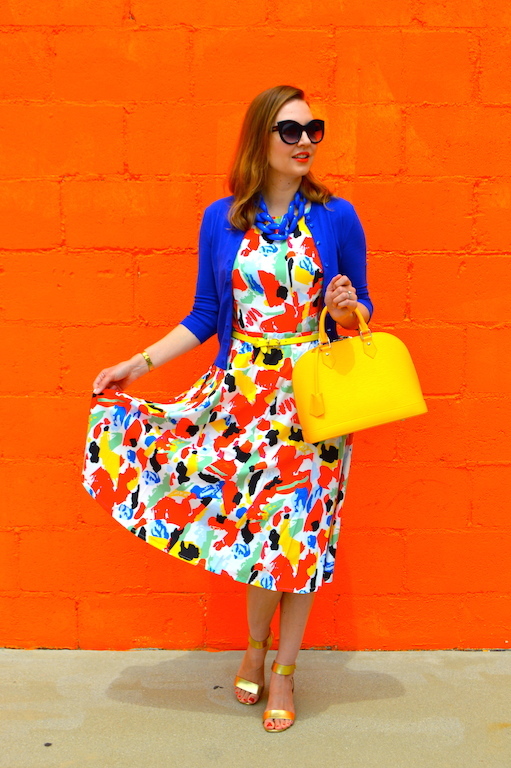 I love these vibrant prints and colors! How pretty! What a pretty dress and so reasonable. It looks well made too. 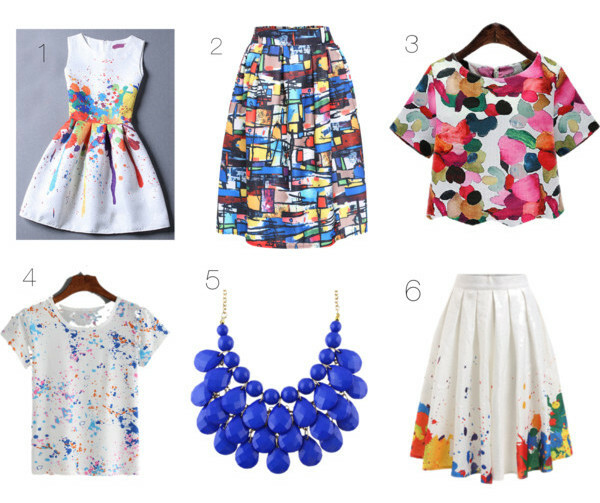 I love the top row of your SheIn picks too. I love how you associate colors with things like this bright Orange with Cheetos and the other post the purple with Prince.